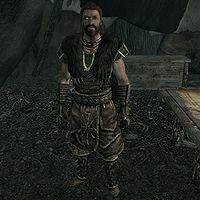 Istar Cairn-Breaker is a Nord soldier and the commanding officer of the Haafingar Stormcloak Camp. His tent is larger than the small one man tents the regular Stormcloak Soldiers have and contains a chest and an end table. He has no unique dialogue and spends the day wandering the camp with the rest of the soldiers. Istar wears Stormcloak officer armor along with a pair of matching bracers and boots. He either wields a one-handed weapon and a shield or a two-handed weapon, both of which can be up to steel in quality. The shield can also be up to steel quality. He carries a hunting bow which he supplements with 12 steel arrows and has a spare iron dagger. When Battle for Solitude is complete Istar will move to Castle Dour, where his RefID changes to 00077DE3. This page was last modified on 10 December 2018, at 21:03.